Plenty of fish in the sea and hundreds of vacuum cleaners on Amazon. In this age of advanced home appliances, saying it is difficult to find the best vacuum cleaner would be an understatement. Still, we have to try. Today I have picked two of Dyson’s best-reviewed lines – Dyson V6 and Dyson V8. To start our hunt for the best vacuum cleaner, I will guide you through a Dyson V8 vs V6 detailed comparison. If you do not have time for the breakdown analysis, just skip to the end and view the comparison chart. Introducing the Dyson V6 – What are the V6 Models? Dyson’s V6 range was meant to be an upgrade on the DC59 vacuums. One of the many attractions of the V6 series is its small, cordless and super maneuverable body. Dyson aimed at packing a powerful motor in a compact package, with upgraded tools and attachments. And boy, did they succeed! Let’s go over the main features of each variant. Then we can pit them against the V8 models to find the ultimate winner. Dyson V6 Cord Free/Basic – What’s Common in all V6 Variants? The V6 standard model is the base of all other V6 variants. The later variants include the same basic features but combine it with some new ones. The basic V6 model features Dyson’s patented cyclone technology and HEPA filtration. Its digital V6 motor rotates up to 11,000 times a minute. The new technology of the powerful digital motor combined with 15 cyclones arranged in two tiers, provides strong air suction. Fine dust is captured along with bacteria and allergens. The post-motor filter picks up any dirt that is left. The whole machine sports a sealed system so captured allergens don’t escape into the clean air. The basic V6 can be held and used in multiple ways. Dyson made sure of that with the vacuum cleaners new design tweaks. This versatility of form isn’t just limited to the basic version though. All other V6 models too can be converted into a handheld. Ceilings and hard to reach areas are not off limits anymore. The V6 standard model can run up to 20 minutes in regular cleaning mode. In max setting, however, the vacuum cleaner runs up to 6 minutes providing a strong suction of 100 air watts. It takes up to 3.5 hours to fully recharge the battery. The bin size is not impressive at just 0.11 gallons. But emptying it is less hassle. You just push a button to dump the waste. What’s New in Dyson V6 Cordless Motorhead? Holding all other things the same as the basic model, the Dyson V6 Motorhead introduces a motor that operates with 75% more power than the basic. This motor is located inside the cleaner head itself allowing for a deep cleaning. It is called the direct drive cleaner head. 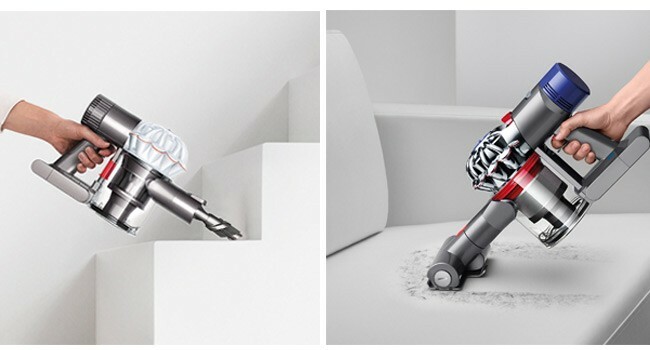 Dyson V6 Motorhead comes with an additional crevice tool to clean all the unreachable areas. Introducing Dyson V8 – What are the Improved Features? Dyson V8 range made its debut in 2016. It upholds Dyson’s most recent innovations. There are currently two models in this series – V8 Animal and V8 Absolute. One of the most important improvements from the V6 to V8 is its enhanced battery life. Dyson paid heed to the complaints of V6 users about the receptacle being too small. The V8 range vacuum cleaners can finally redeem Dyson with their larger bin volume. There are other significant improvements in the V8 line. 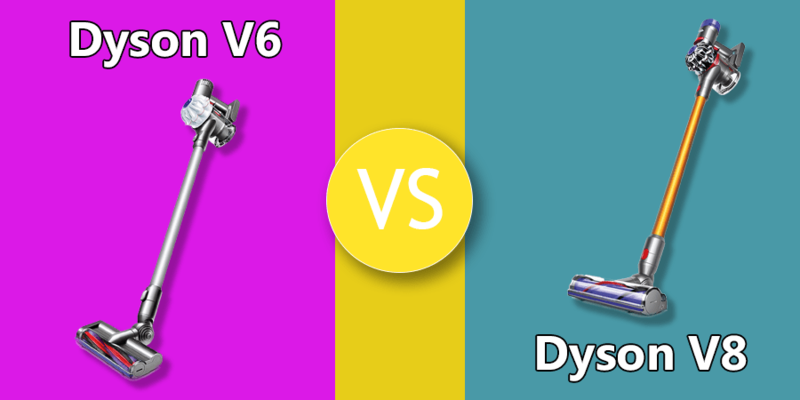 We will explore them in the Dyson V8 vs Dyson V6 head to head comparison. Dyson V8 Animal claims to be designed for households with pets. Two new attachments have been included in this variant especially for removing hair from your carpets and furniture. A soft dusting brush and a mini motorized tool are the additional accessories that come with the package. The mini motorized tool has stiff bristles to agitate pet hair from the depths of your carpet or upholstery. The soft dusting brush carefully removes hair without scratching the surface. A crevice tool also comes with the package. Dyson saved its game-changing feature for the Absolute variant just like it did with the V6 series. The V8 Absolute has the same configuration as the V8 Animal. Only it has one additional tool – the soft roller cleaner head. Also known as the ‘fluffy tool’, this cleaner head was specially designed to clean hard floors. Now that you have discovered all the variants of each Dyson vacuum cleaner series, it’s time for our most anticipated head to head comparison. If you have read the segments above, it is clear that the Dyson V6 Motorhead and V8 Absolute are the best candidates for each series. It is only logical to compare these models to see how the Dyson ranges fare against each other. 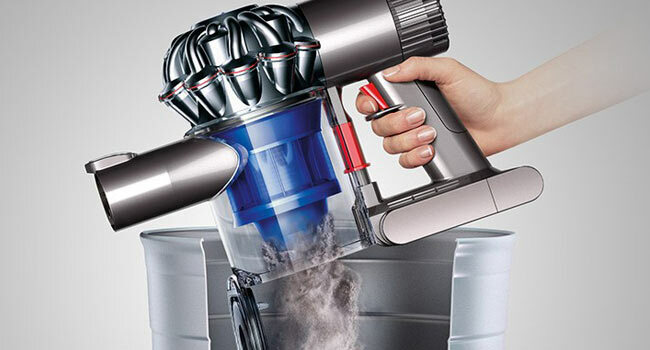 As you recall, the motor equipped inside the Dyson V6 variants produces 100 air watts of power. The Dyson V8 range introduced an upgraded, more powerful motor that provides a maximum suction of 115 air watts. 15 cyclones sorted into two tiers are present in both series. Since Dyson V6 and Dyson V8, both series have similar tools and attachments, it’s a bit difficult to understand their respective capabilities to clean different surfaces if you haven’t seen them in action. 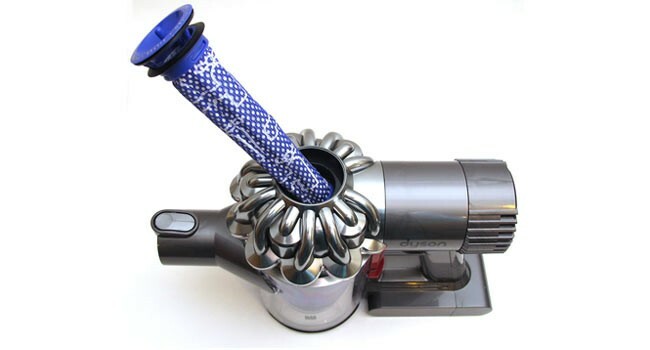 Carpets: Dyson V6 Motorhead has a motorized brush bar for generating powerful suction while deep cleaning carpets. Although the V6 cleans carpets fairly well, it lacks agitation compared to the V8. In practice, the V8 has outperformed V6 on the carpeted surface. Fine dust meshed with carpet fabric is one of the hardest cleaning tests a vacuum cleaner can face. The V8 had no problem sucking the fine dust off of carpets. Hard Floors: The V8 line has an obvious advantage in this arena. The soft roller cleaner head makes sure your expensive hardwood floor is cleaned with care. It has an open front that allows it to pick up large debris instead of just pushing it around. The fluffy part ensures that you floor remain unscathed. The soft roller cleaner head also picks up tiny debris from the floor cracks with ease. Pet hair removal: The V6 variants lack the soft dusting brush and mini motorized brush bar that come with Dyson V8. These tools separate and pick up pet hair from carpets, rugs and upholstery. Hard to Reach Spots: Both the V6 and V8 come with crevice tools to clean hard to reach spots. One thing gives the V6 an advantage over the V8. It’s the vacuum cleaners’ slightly lighter weight. It makes holding the stick upwards easy while cleaning ceilings. Noise Level: The V8 range makes half as much noise as the V6 series while operating. Thanks to Dyson for using air blade multipliers to make the machine quieter. Dyson V8 has introduced an improvement in the bin capacity sector. The previous V6 series had a bin volume of 0.11 gallons. If you were to clean multiple medium-sized rooms, you would have to stop and empty the bin a couple of times during the session. It becomes even more of an inconvenience while dealing with pet hair, as the bin tends to quickly fill up. The V8 series has a larger 0.14-gallon bin capacity. It holds more dirt and has to be emptied less frequently. Both the Dyson series have sealed receptacle technology. Dust and allergens do not leak out of the machine once captured. The V6 line was able to dump dirt by the push of a button. You did not have to touch the bin with your hands to empty it. Cool, but it did not always get rid of all the dirt. Sometimes dirt stuck around the edges of the bin. The bin emptying process has been made more hygienic and simple in the V8 line. When you pull the lever, the surface of the bin pushes and dislodges dirt itself. Then the bottom door opens and dirt is dumped. Dyson V6 and V8 both use HEPA filters to complement their cyclone technology. For houses with dust sensitive and allergic residents, a vacuum cleaner with HEPA filters would be fantastic. The cyclones blow dirt and dust out of the air with strong suction. It then gets transferred to the filtration system. HEPA filters push air through a fine mesh and capture the tiniest dirt particles. They are capable of removing 99.9% allergens from the air you breathe. If you live near an industrial area, or anywhere with a chance of air pollution, get a vacuum with HEPA filters. 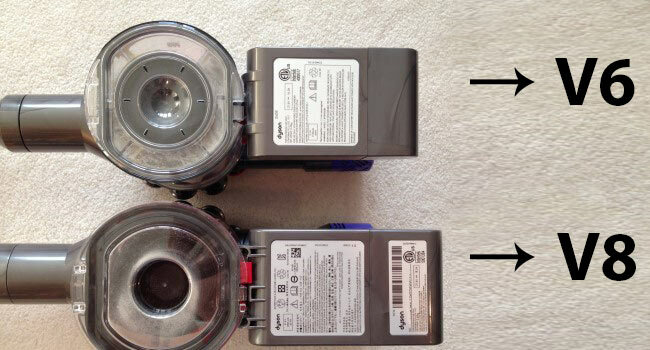 Dyson included post motor filters in both ranges. The post-motor filter captures any dirt that is left behind. It is a tie between the vacuum cleaners because both of them have an identical filtration system. As I have said earlier, the V8 has an improved battery life. Dyson geared the V8 with nickel cobalt aluminum batteries, whereas the V6 was powered by a lithium-ion battery. The new battery ensures the V8’s unfading performance throughout the total run time. In the standard setting with non-electric attachments, Dyson V8 can run up to 40 minutes. It is double the time V6 is able to run. With motorized tools, the V8 runs up to 25 minutes. The V6’s runtime with the similar tool was significantly low at just 14 minutes. In boost mode, the V8 uses its maximum suction power and provides an outstanding cleaning for 7 minutes. The V6 runs for up to 6 minutes in max setting. Dyson V8 provides longer run time but it has to be given a longer recharge time too. The machine takes up to 5 hours to be fully charged. The V6, for that matter, takes only 3.5 hours. Both series come with their own docking stations. The docking stations can be mounted on wall for convenient placement. The V8 is slightly heavier at 5.75 pounds. The V6 is lighter at 5.1 pounds. Both of them are light and maneuverable. Both can be converted into handhelds. There is no way to sugarcoat this, Dyson V8 is expensive. I can’t call the V6 cheap either. But it surely costs fewer bucks depending on the variant. Who Should Get Dyson V6? If you live in a small apartment with no expensive hardwood floors, go with the V6. You do not need the soft roller cleaner head for carpeted or bare floors. The 40 minute run time of the V8 would not be necessary while cleaning a two bedroom apartment. The V6 takes less time to be powered up again as well. Who Should Get Dyson V8? If you are living in a fairly spacy house with multiple cleaning areas, go with the V8. You need the larger bin and improved battery life. You cannot stop mid-cleaning and wait a couple of hours for the vacuum cleaner to be recharged, can you? Final Verdict – Which is the Superior Series? Dyson V8 is clearly the superior series of cordless vacuum cleaners in terms of performance, power and battery life.